well, what can I say? This week has been quite mixed again. Work has been work and home has been home. So... Friday night was the Sergeants Mess Summer Ball and this year, I took my wife and an additional guest (which was nice). We all had a great time and knocked it on the head after 1am in the morning. I was a little worse for wear and really didn't sleep very well so Saturday was written off and after another rough night (very little sleep) Sunday has been pretty quiet too. It's life in the fast lane at the moment! All patriotic! This one is better than the last one because I have joined two looms together now so that I can get longer bracelets... so the stars go all the way around. It took me about half an hour and cost me about 30p... that is great value for a hobby. You should all be aware that I am a bit of a fan of AT VOTOMs. Well... on my travels through Ebay, I spotted some Gashapon mini-mechs and couldn't believe the price so I had to buy them. 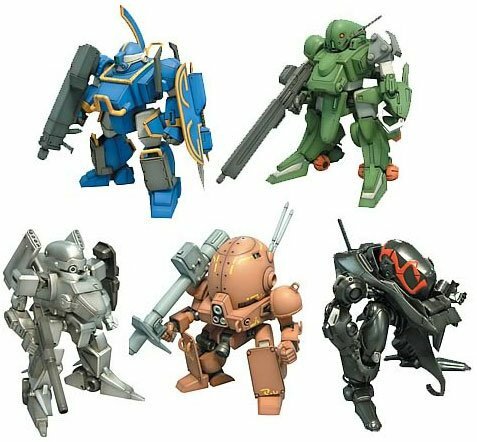 I got six 1/60scale VOTOMS mechs (each about 3.5inches tall) for the grand price of £12.99 including postage! How could I refuse? 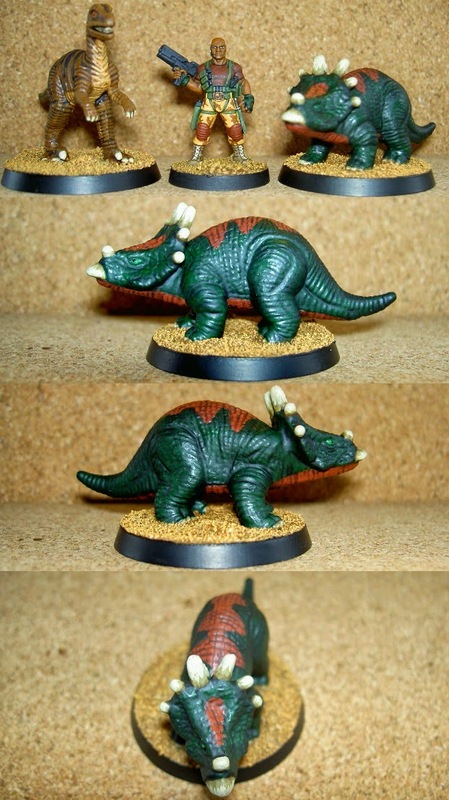 They are made of a slightly rubbery material but are painted and hacve a certain amount of movement. Once I have decided how I am going to deal with them, I will post some pix... but here is a link to five of them: LINK. They are pretty cool, aren't they? Well... that is about that for today. I hope you are enjoying life. See you from the shady spot! I have become a Loomatic! This week has been one where I just needed to reflect on life and go with the flow. I went to a funeral on Monday and it was a very well run thing but it was the last time I'll ever see my friend, Angie, (even though she was in her transport pod to the next level) again so it does make you think about life and how things go. So... I have tried to get some hobby stuff done this week but have failed dismally. I have no enthusiasm for it and the ideas that are coming to my mind have become such a burden that I can't focus on any of my on-going projects. The ideas are namely bike designs for Grymn and transport options for Squats... both need to be found and/or created... I am hoping that the transport can be 'off the shelf' but I am expecting the bike to be home made. What have I been doing instead of my hobby... well, internet mainly. 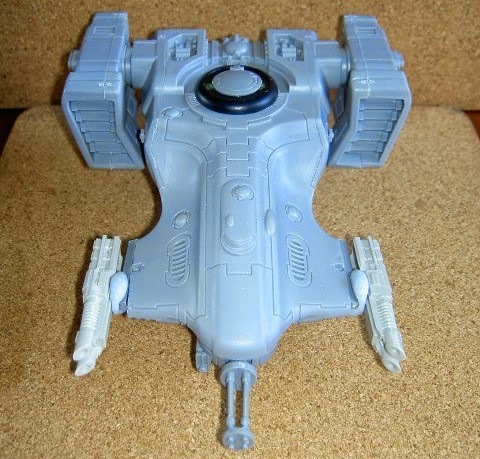 In fact, during one of my 'Ebay drive-bys' I managed to pick up an awesome bargain... and have a box of 36 'on-the-sprue' Squats on the way! They cost me less than £50.00 but have no bases (which isn't a problem). I was very pleased with that! Yes... I have started to mess around with looms, hooks and tiny rubber bands. It is quite relaxing, takes a bit of thought and both my wife and daughter think it is great because they get the finished results. The only down side was that the loom I had was too short... so I bought 2 and with a bit of chopping, bracing and gluing, have joined them together. Who said an old dog can't learn new tricks? 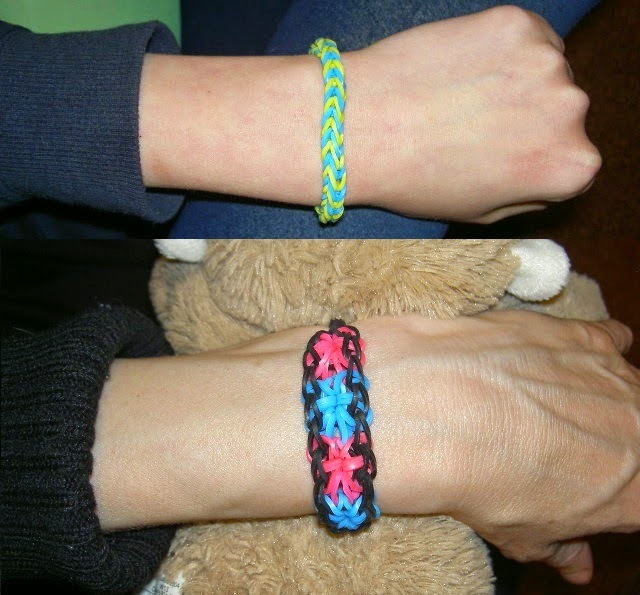 I also used to make Scouby bracelets with my daughter so this is just another little handy craft under my belt. I know it is pretty random on here at the moment but things usually get a bit weird when the weather warms up... maybe sometime soon, I will get back on it and start to focus a bit. I hope so. See you from the wishing tree! I know I sound like a bit of a stuck record but I have had another slow hobby week this week. 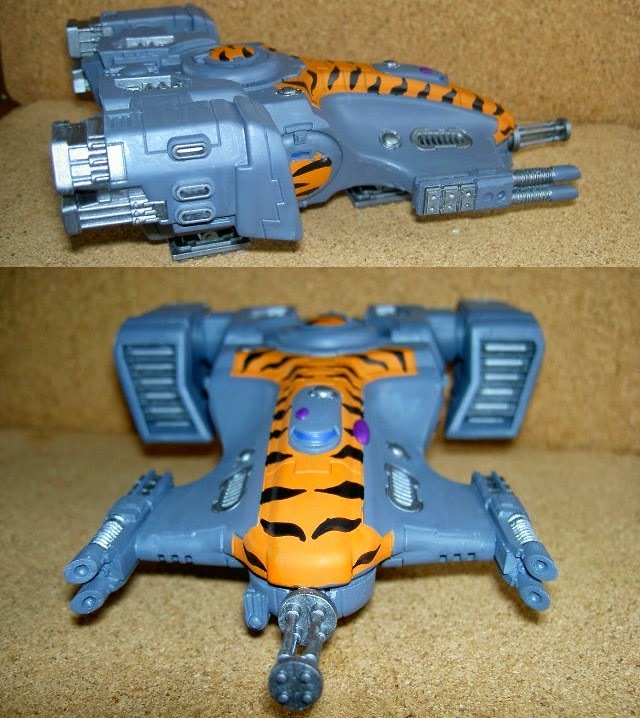 I have put a bunch of plastic space Dwarfs into the Dettol and cleaned them off. I then separated them down into their components and quickly discovered that I have got enough heads/bodies/weapons for about 35 troops... but not enough arms. It isn't a problem because I'll just sculpt them on but it does add to the length of time it will take to put them all together... and it is something that will be on the back burner for now anyway. I've been throwing bids on Ebay this week and failing in glorious fashion... so I don't have any news about that. 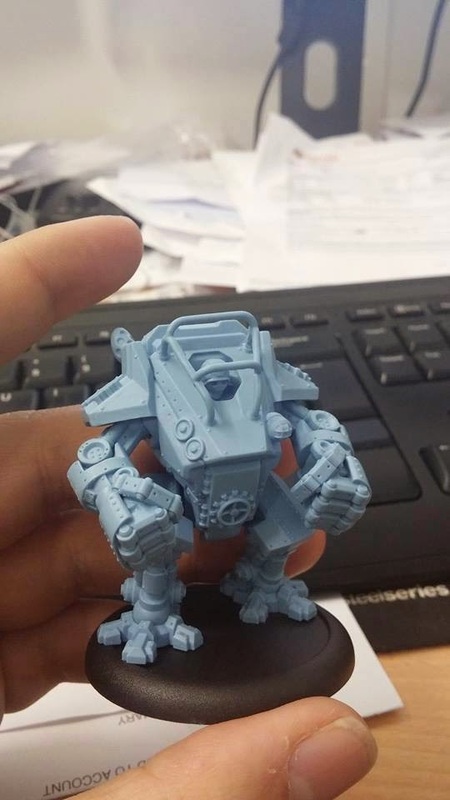 I have pledged for a small gathering of these awesome little mechs and I hope that they are as awesome in hand as they appear on the site. 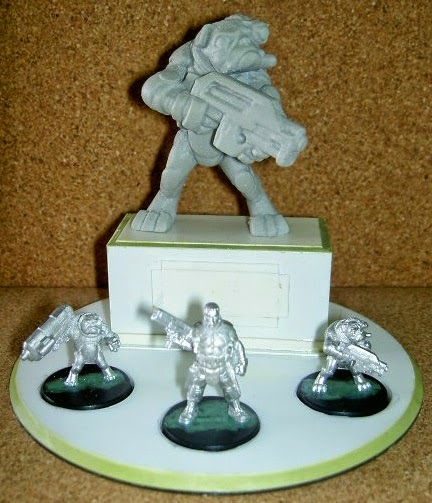 I think that this will make an excellent addition to any Squat/Space Dwarf force... oh... and Warzone Bauhaus force (of course). You never know; you may be inspired enough to join in with your own offering. See you from the pit! This week has been one of highs and lows. Once we are sure that the Robins aren't going to reuse the nest, I'll clear it from the fan duct. On the other hand, one of my friends from school passed away after a long struggle with cancer. If I was a religious man, I might say that what the lord gives with one hand, he takes with the other... but I'm not... so I'll just say that this week has been one of reflection. Rest in Peace, Angie. You've earned it. The person I am creating this for, likes Pugs so I couldn't think of anyone more appropriate to send this one-of-a-kind 'statue' to. I still have a long way to go and the three miniatures at the front will be removeable so they can be used for gaming. Apart from that, I haven't done any hobby stuff this week... but as you may have gathered, my mind has been on other things. See you from the back of the room, just behind the rubber plant! 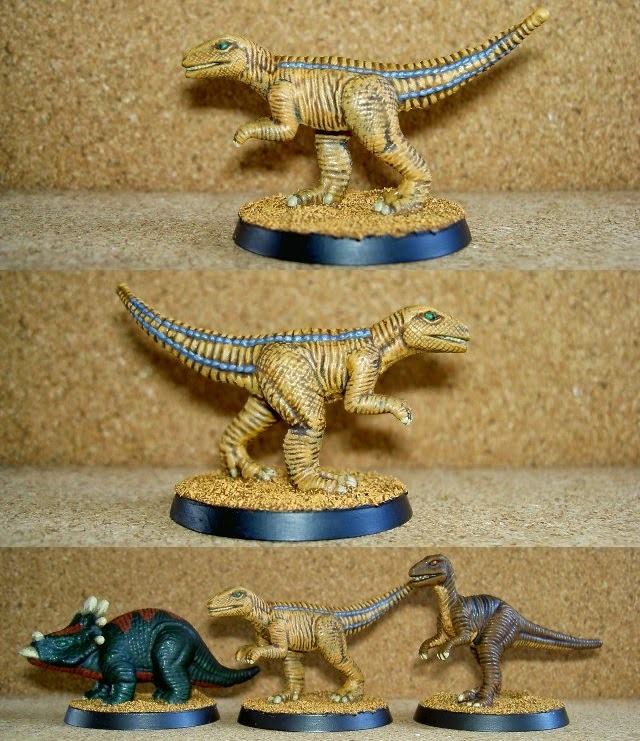 As you can see, I have now got three finished and the beauty of these is... no matter how badly I paint them, they will still look much better than how they started. That means I can practically switch off while I paint and still end up with an OK finished product... and that works for me when I am tired out. The other day, I noticed a strange noise coming from the ventilation fan in the kitchen so I investigated and discovered that the outside vent had a hole in it and there appeared to be nest material sticking out. I disabled the fan switch (so it couldn't be switched on), kept an eye on things and soon found out that Robins were busy flitting backwards and forwards with beaks full of food. 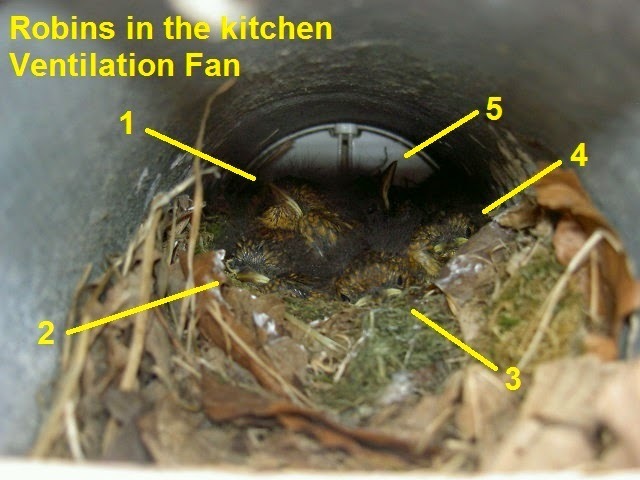 I decided I'd wait until things were properly settled and take a peek... and the best way I could think of doing it was with a camera... and as you can see, we have at least five Robin chicks in our fan duct. How cool is that? 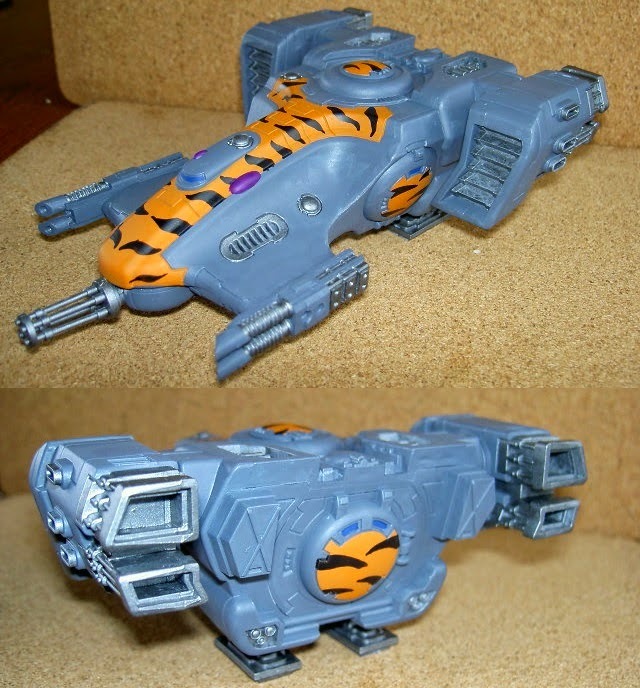 They get a nice Devilfish to travel about in. As you can see, it is still WIP and still needs clean-up but the basic assembly is finished (apart from the front guns). Well, that appears to be the end of another mixed bag of stuff. See you from the hide!